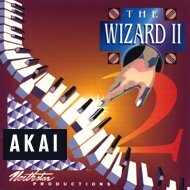 The Wizard II is a CD-ROM for the E-mu Emulator III/X/ESI/E4, Akai S1000 and Digidesign SampleCell which incorporates 78 banks. It has been described as existing somewhere between magic and light, between music and sound effects. The Wizard II is perfect for film and video, as well as for pro music effects. It follows on the heels of the tremendous success of Wizard I, used in such films as "The Lawnmower Man" and "The Tommyknockers". The Wizard II, developed by Terry Grame of New York who contributed to the development of E-mu's Morpheus and Vintage Keys, has a slightly more musical direction than Wizard I. Many of the sounds were developed using granular software synthesis techniques. Northstar has further engineered and designed the Wizard banks for optimum control. The Wizard II gives you the ability to "score instantly" or create moods at will! In the world of sampled sounds, it is truly unique!